The K800i is one of the latest phones from SonyEricsson and it offers almost an overload of features. A 3.2 megapixel auto focus camera, 3G (UMTS) support, highly visible QVGA display and powerful MP3 playback being some of the most prominent ones. The phone has received a face lift from last year's K750i. It is noticeably heavier and a shade bulkier due to larger display and a beefier lens cover. SE must have listened to disappointed users who found the k750i a bit "plasticky". Several plastic panels have been replaced with discreet brushed steel and the squeaky plastic buttons have been replaced with rubber covered ones. With the 3G (UMTS) comes services like mobile TV, faster data transfers and video calling. 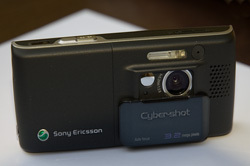 A second lower grade camera (CLI) has been fitted on the front side of the phone to be used during video calls. You can also follow your favourite TV show (Big Brother?) in low quality but it will cost you. 3.2 megapixels allows for even better quality pictures than with the previous 2.0 megapixel model. Further added photo features are Sony BestPic-TM and a proper Xenon flash. BestPic-TM is a term for automatically taking 8 pictures during a second when the shutter button is pressed down. The user can then choose one or more best pictures to keep from the set. A Xenon flash is normally used in traditional digital cameras and is much more powerful than the previous LED flash used in current mobile phones. One downside is that the Xenon flash cannot be turned on in continuous mode like the older LED flash. I for one will miss the emergency torch feature the LED flash offered. Here is an unprocessed sample shot from the K800i 3.2 megapixel camera. Naturally the phone supports the standard messaging formats like SMS, email, MMS and etc. A new addition is a basic RSS feeder. You can add your favourite RSS feeds and schedule automatic updates. The phone will alert you when there are new entries and show short excerpts. The built in web browser has been improved and together with 3G speeds the browsing experience is even closer to a standard PC. Despite the browser improvements, I prefer the new Opera Mini which is supported on most j2me phones. The phone uses the latest Sony memory format Memory Stick Micro (aka M2). If this is your first Sony product you will be pleased with the physical size of the memory; it is the size of a finger nail! If you however have a few memory stick formats laying around at home you may be annoyed at having to purchase yet another one. The current largest capacity is 1GB and for a brand new format the price is surprisingly affordable (£42). Vodafone does not supply a M2 memory stick with the phone so if you think you will require more memory than the built-in 62MB make sure to purchase it ahead to avoid disappointment. Vodafone has yet again branded the phone heavily with their icons, themes and alternative short cuts (majority of them leading online to Vodafone Live!). It is possible to use an online service to re-brand the phone to original SE settings but I am cautions to do this and maybe risking loosing data connectivity. At least this time Vodafone did not cripple MP3 ring tones capability like they did on the k750i. One of the easiest ways of transporting contacts to a new phone is via Outlook. Create a new contacts folder in Outlook, set up to sync your phone with that folder and synchronise your old phone. Follow up by connecting your new phone, make sure to select "Outlook overwrites phone" when synchronising and sync the new phone. All your contacts should be preserved. I have just discovered the coded memo feature and find it very useful. It lets you enter multiple codes with a descriptive name and a code field. For example "bank account x" and "1234 1111111". The information is protected by a 4 digit password. If the wrong password is entered, all the codes are presented scrambled. This means that a potential information thief can never be sure whether he/she guessed the correct 4 digit pin. One reservation would be that there is no information on what kind of algorithm is used for the protection nor how well the code memo feature would withstand a hardware attack. Identity Fraud and Identity Theft in the UK, you next? This entry was posted at 02:54 PM. Good review, I'd agree with everything you've said - and you've just convinced me to download opera for it. Cheers! btw as of this morning (10/9) Carphone Warehouse have included the Sony M2 cards in their 1/3 off all memory cards and are selling the 1Gb card cheaper than anywhere else on the high street - got it for £39.99 today, when other suppliers were asking for £59.99. Haven't even seen it cheaper than that online (when you count postage). I have seen it for £31 inc delivery (memorymegastore.com) but CPW is a shop you can trust. Thanx for the tip! I've just received a Vodafone-branded K800i, and the camera button on the side of the phone (so on the top when using the phone as a landscape-format camera) doesn't take pictures, it only focuses. The camera will only take pictures by pressing the joystick in. Does your phone have this problem? I have used an O2 (ie unbranded) K800i and that did take photos using the side button. So, is this a functionality change by Vodafone or is my phone a dud? Take it to a Vodafone shop and they'll send it away for repair or replacement. I just got my phone back from repair; the speaker had stopped working. It was very straight forward and took 6 days. You may get a re-branded phone back if you do this so complain if you don't want a re-branded phone (for example if your phone was brand new). Oh, and make sure to back up all your phone data (games, photos, contacts, etc) as they always wipe the phone during repair. good. but did the k800 can be unlock (network)? i mean is there any software to generate the NUC. In the case with SonyEricsson I don't think you can generate a NUC (unlocking code) from just the IMEI number like you can with other mobile phones. Instead the manufacturer (SonyEricsson) has a list of unlocking codes which it passes on to the network operator (Vodafone). I unlocked my phone for free just 2 weeks ago by calling Vodafone and asking for the unlocking key. Apparently they did not have it in their data base yet and had to request it from SonyEricsson but I received the unlocking code only 4 days later. I am Jami from india. I got a K800i mobile gift from my brother-in-law and he brought it from UK. Can i unlock it here in India , if so can u plz tell me how i can do that. You can NOT unlock the K800i yourself with a DCU-60 USB cable. Safest way is to ask the UK operator to release the unlocking code. They should do this free if the phone is older than one year or else you may have to pay £15-25 for the privilege. There should be plenty of mobile phone shops in India that have the tools to unlock the K800i with force. You can flash it with a local firmware. I have recently used Wotan server K800i service and it is very professional and good value. For you I would recommend the Generic Asia / Pacific version as it includes the following languages: English, Indonesian-Bahasar, Malay, Philippine-Tagalog, Vietnamese, Chinese simplified. If you are lucky the new firmware may even fix your camera issues. Good morning and thanks for this review. I have just bought a Vodafone-branded K800 in Belgium and found that it has the Vodafone-Live function so entrenched that I can't seem to get through to the internet using another provider - notably the provider I have my mobile subscription with (in Belgium, phones are sold without SIM-lock). I already downloaded the WAP settings from SE's website, but the only option I seem to have to go to the Internet is (still) via the Vodafone-Live entry in the main menu. Do you have any idea what I can sort that one out? hello i bought K800i from UK, at present i m india, i m not able to use the Indian simcards in that, "PLEASE INSERT CORRECT SIM" this is the display i am seeing. pls let me know whaat is the problem and how would i rectify it. Obviously the phone is locked to a specific operator here in the UK (Vodafone, O2, Orange or such). If you were not aware of this complain to the seller! If the phone is older than 1 year the original network will be able to provide the unlocking code for free. i want to SIM free my mobile sony ericsson w880i. Hi David, i recently purchased a SE K800i phone on the PAYG plan. i have no idea if the phone is locked..normally they are on contract phones..after i received delivery of the phone..i was a bit disappointed to find out that all icons on this phone have been locked to fit Vodafone style..even if i changed themes..the same annoying icons appear..Is there any way through which i can reset to the original SEK800i settings.. Pls let me know asap as i'm really frustrated on buying it.. but i like the phone..but just don't seem to like the Vodafone locked interface. I have used the debranding service provided by DavinciTeam but if you are not comfortable doing firmware updates to your phone yourself a high street "unlocking" shop should be able to do the debranding as well. Only the operator can provide you the unlocking code for your SonyEricsson mobile phone and should do this for free. Give them a call! Hi David! I bought a K800i in December 2008 from Vodafone. Is there any way to get it unlocked from the Vodafone people without paying the GBP15-20? I mean, I was only in the UK for about a month and there should be some reason that can convince them (Vodafone customer care people) that I don't need to pay a huge price for unlocking the handset. Thanks! Are you still in the UK? A back alley electronics shop can often unlock a SonyEricsson mobile phone for GBP5-15. The operators subsidise the mobile phones (I get a free upgrade once a year) so I understand they have to protect their income somehow. You can keep calling back until you get a "nicer" customer representative but if you got the mobile phone for free or for nearly free don't expect them to unlock it for you. This is a cool blog, the coolest I've seen on this phone! My question is, David, is this phone still up there after 2 years or so on the market? What I mean is are the functions and features of this phone at par with the new phones coming now, would it be advisable for me to get the phone now? Thanks a bunch. The mobile market is a rapidly changing environment and usually I find phones to be superseded in 6 to 12 months. The K800i is however a very strong phone even today. You can also evaluate the minor upgrades like the K810i and the K850i but the K800i will likely be dirty cheap by now. In the last 10 years I have religiously been upgrading my phone 1-2 times per year but I have not found any major reason to upgrade from the K800i. Let us know what phone you decide on!